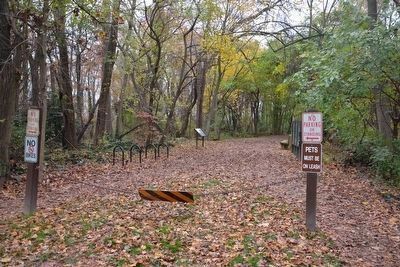 Here, 400 years ago, the Piscataway tribe fed themselves on fish and waterfowl. In the early 1800s, Virginia farmers built retaining walls, called dykes, to drain this marsh and make farmland. The dykes proved too hard to keep intact. 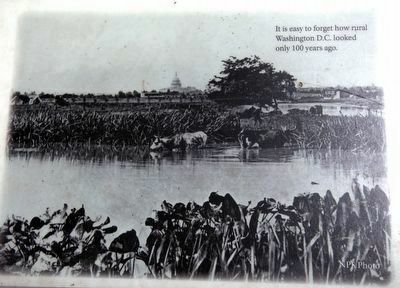 Without dyles, in a matter of decades Potomac tides reclaimed this marsh. By the 1950s, metropolitan Washington D.C. was booming. Developers dug gravel out of Dyke Marsh and dumped debris in its place. Gravel mining stopped in the early 1970s, but the erosion that digging started still harms Dyke Marsh today. 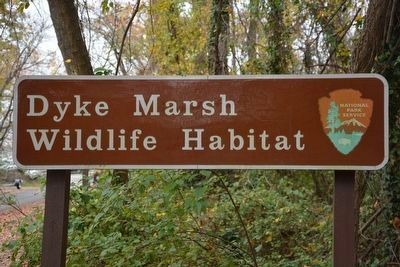 In 1974, Congress directed the National Park Service to protect and restore Dyke Marsh. Even now, there is much left to do. What we do today will determine if these wetlands ever truly recover.
. It is at the beginning of the Dyke Marsh Trail. Marker is in this post office area: Alexandria VA 22307, United States of America. Touch for directions. Other nearby markers. At least 8 other markers are within walking distance of this marker. Colonial Fort (about 600 feet away, measured in a direct line); Historic Jones Point (approx. 0.2 miles away); A Place to Rest—or Nest (approx. ¼ mile away); These Trees (approx. 0.3 miles away); Anatomy of a Tidal Marsh (approx. half a mile away); A Fine Improvable Marsh (approx. 0.6 miles away); Defenses of Washington (approx. 0.9 miles away); Fort Willard (approx. 0.9 miles away). Touch for a list and map of all markers in Alexandria. More about this marker. Marker contains four images. They are the photograph reproduced on this page as image No. 2 and three maps, reproduced on this page as image No. 3. 3. Going ... Going ... Gone? 1937, 432 acres. 1959, 371 acres. 2005, 244 acres. Marker is in the distance, on the left side of the trail (in the center of the picture). This is the NPS sign near the entrance to the trail. More. 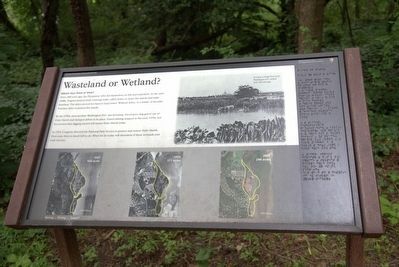 Search the internet for Wasteland or Wetland?. Credits. This page was last revised on May 18, 2018. This page originally submitted on October 13, 2015, by J. J. Prats of Powell, Ohio. This page has been viewed 230 times since then and 13 times this year. Last updated on May 9, 2018, by A. Taylor of Laurel, Maryland. Photos: 1, 2, 3. submitted on October 13, 2015, by J. J. Prats of Powell, Ohio. 4, 5. submitted on December 31, 2015, by A. Taylor of Laurel, Maryland. • Bill Pfingsten was the editor who published this page.